Meet local, Safer Neighbourhood Police team for good advice on how to prevent crime, deal with anti-social behaviour and how to best report crime. We’ll also help those who have been victims of crime. Win the Neighbourhood Watch quiz and win vouchers worth £20. 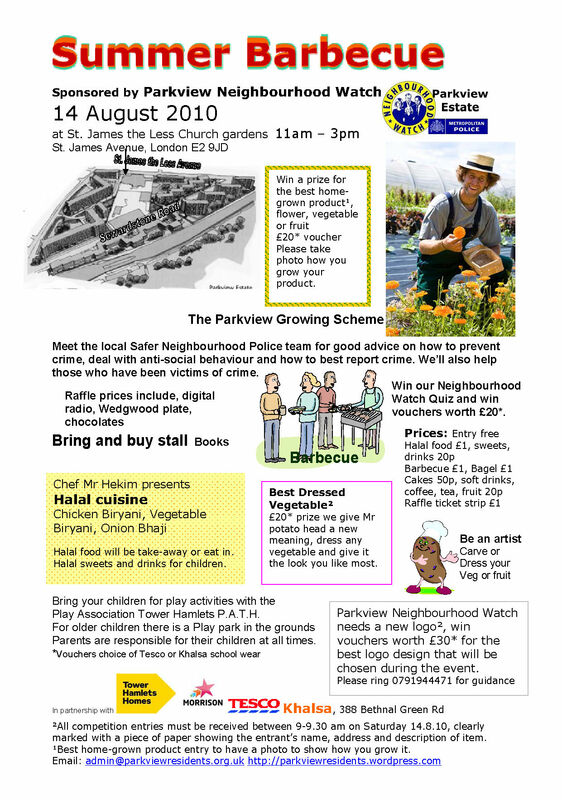 Parkview Neighbourhood Watch needs a new logo, win vouchers worth £30 for the best logo design that will be chosen during the event. Bring your children for play activities with the Play Association Tower Hamlets PATH, for older children there is a Play park in the grounds, parents are responsible for their children at all times. Win a price for the best dressed fruit or vegetable, carve or dress it to win £20. Look here for some inspirations. Win a prize of £20 for the best home-grown vegetable, flower or fruit, please bring photo of how you grew your product. Chef Mr Hekim present Halal cuisine, Chicken Biryani, Vegetable Biryani, Onion Bhaji, throughout the event. All foods in take-away containers for those not able to eat during the day because of Ramadan. Prices are: Halal food £1; Barbecue £1, Bagel £1, drinks 20p, raffle ticket strip £1. Raffle prizes include a digital radio, chocolates, Wedgwood plate and more. This event is run in partnership with Tower Hamlets Homes, Morrison, Tesco, Khalsa School wear, 388 Bethnal Green Road. Voucher prizes are a choice of Tesco or Khalsa school wear vouchers. If you wish to be included in the list of sponsors please contact us by 7 July the latest. All entries for competitions must be received on Saturday morning at 9am but not later than 10am. Entries must be clearly marked and have a piece of paper with the name and address of the competitor. In the case of home grown produce please supply a picture of the location and or when you tend to your produce. We apologise for not having been able to avoid Ramadan when organising this event but cannot now change the schedule due to contractual arrangements in place.